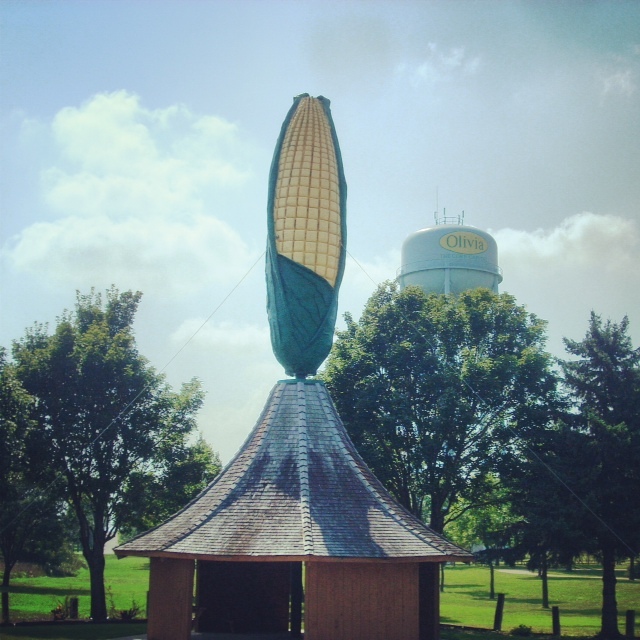 Olivia, MN is home to one of the more iconic and classic roadside attractions, the Corncob Gazebo. 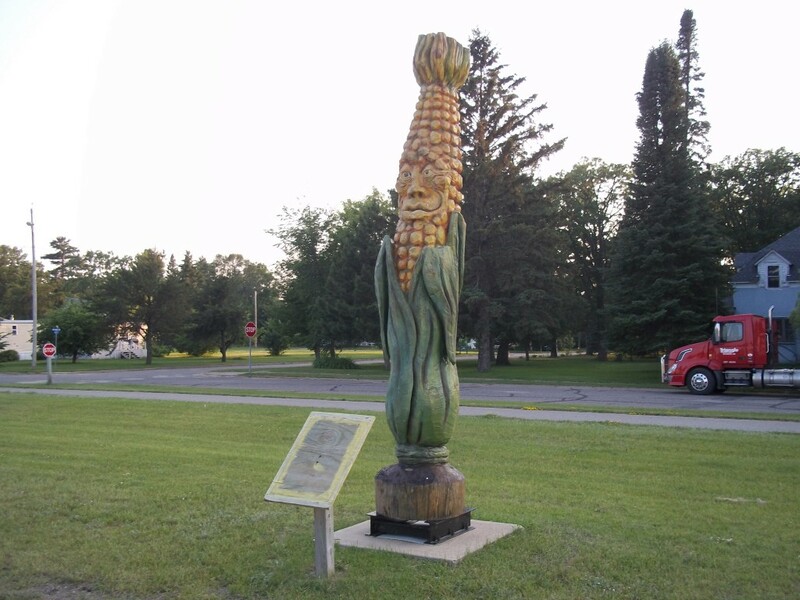 In a small wayside park on the side of Highway 212 which runs straight across the state from Minneapolis to South Dakota, there stands a 25-ft tall corncob, perfectly proportioned, on top of a gazebo. The town’s water tower directly behind it proclaims Olivia as “The Corn Capital.” This is a pretty accurate claim, Olivia sits in the heart of the flat, open prairie so noted for corn farming. The statue was put up in 1973 and allegedly Olivia Newton John showed up for the dedication. Allegedly. Down in southeastern Minnesota we have the largest city outside of the Twin Cities, Rochester. This city owes much of its population to the world-renowned Mayo Clinic, which employs over 30,000 people, the second-largest employer in Minnesota, outside of Minnesota government of course. But Rochester is also known for other industry-leaders such as IBM Computers and Seneca Foods. And outside of Seneca Foods (formerly Libby Foods), an agricultural facility, is another icon: the Corncob Water tower. The water tower can be seen from nearly all over town, but yet its base is completely fenced in as it is part of an industrial compound. One must view and photo it as best they can from a small distance away. The cob is 60-ft tall, making it the world’s largest ear of corn, and lights extruding from around the bottom of the tank keep it illuminated at night. Another fun character, aptly named Colonel Cobber, is found in the small town of Backus, MN. 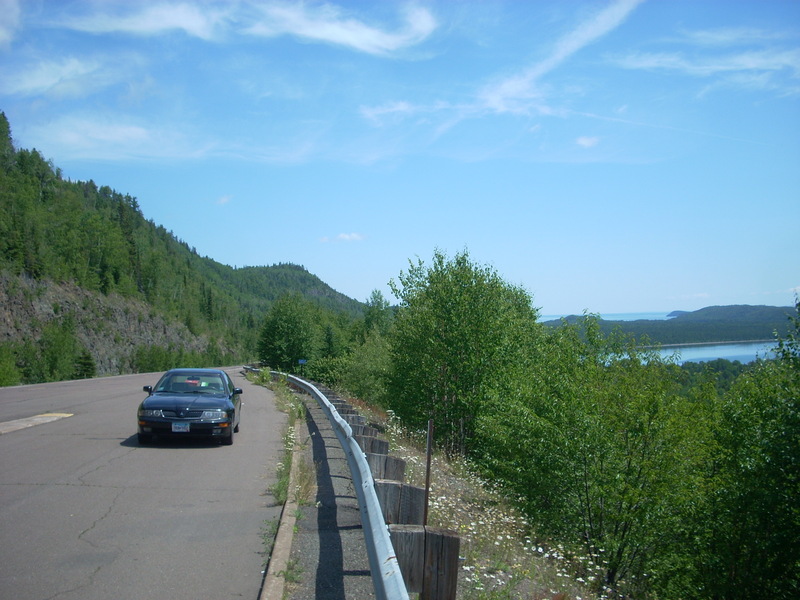 Backus is found on Highway 371 between Brainerd and Walker, in lakes-and-pines country. The quirky chainsaw-carved character, created by Hackensack artist Ross Olsen in 2006, is based on stories of a legendary “salesman” who struck a deal with Paul Bunyan, a sweet-corn fan, that if Bunyan cleared the trees, Cobber would grow more corn for him. But, eventually the deal went bad. Read more here if you like. The paper that tells the story is missing from the plaque in front of the statue, but hopefully Backus makes a more permanent one to replace it. Cobber is found near downtown, right next to the Paul Bunyan Bike Trail that goes through town. The town also holds Backus Corn Fest the second Saturday every August. And last but not least on our big corn tour, we arrive at the Minnesota State Fair in Falcon Heights, MN. Also known as “The Great Minnesota Get-Together,” the 10-day event is the largest state fair in the US by average daily attendance, and second in total attendance to Texas. One of the primary attractions at the State Fair is the fried food. Candy bars, cheese curds, hard-boiled eggs, alligator. You name it. Many come served on a stick. But one of the most enduring and timeless classic items is the “Pronto Pup,” the fair’s version of a corn dog. 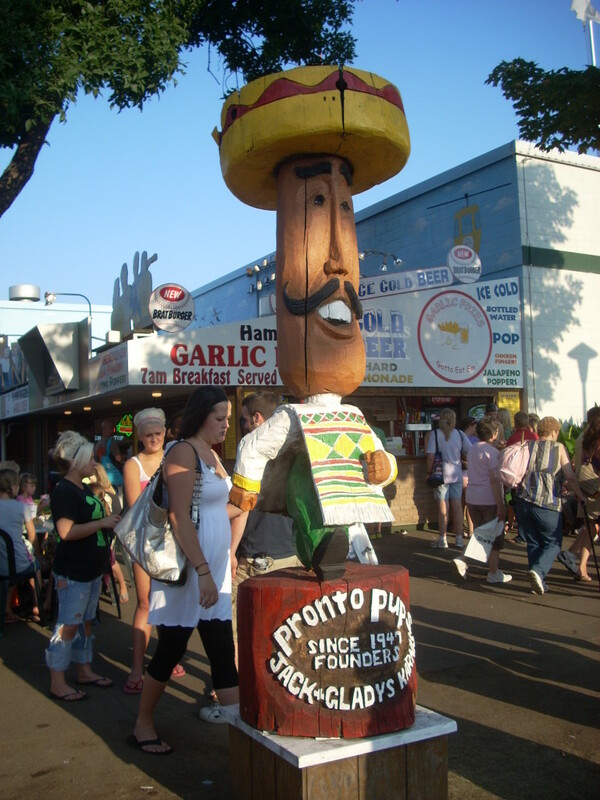 These stands are all over, and the Pronto Pup mascot, a sombrero-wearing moustached corndog gets his own wood-carved statue likeness near one of the many food courts. So this last one is a bit of a stretch. Pronto Pups use a flour based pancake-like batter instead of cornmeal flour. But in our defense, it is said that the corndog was allegedly invented at the Minnesota State Fair in 1941 when a Pronto Pup vendor apparently ran out of his pronto pup batter and was forced to improvise on the spot using cornmeal batter. Allegedly. So this concludes your weekly tour of a handful of assorted Minnesota food-related roadside attractions! If that wasn’t enough, we also have the Jolly Green Giant, the Spam Museum, and the World’s Largest Lefse! More on that later. Olivia Newton-John visited Olivia, Minnesota in July, 1978 when her hit show GREASE was released. Ms Newton-John was given the key to the city along with a very large custom made quilt. She rode an Arabian horse owned by a local girl, Cheryl Knight, in the annual parade and was the Grand Marshal. 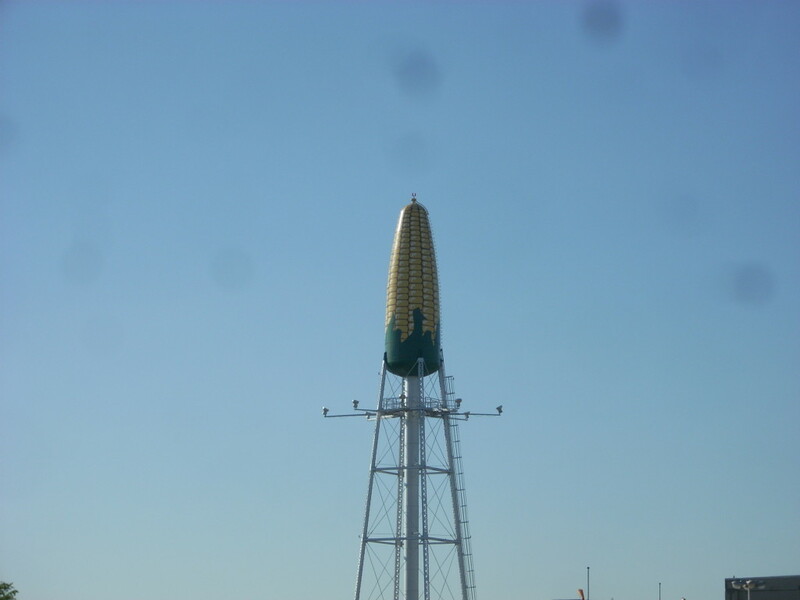 The ear of corn as shown in this picture had been in place for many years prior to Olivia Newton-John’s visit. 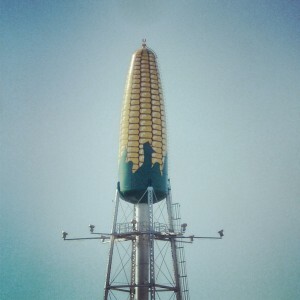 The City of Olivia has been referred to as the CORN CAPITAL OF MINNESOTA due to the many large field corn companies that are headquartered in the city. To this day, there is still a large annual event with a parade and concerts performed by local bands along with the large sweet corn feed in the park.